* Note in below pictures the incorrectly fitted front plate has been fixed - thanks to those that alerted me to the error - goes to show that if in any doubt, always check references. Its been a long time since my first post, I've had a lot of other (non hobby) responsibilities use up most of my time for some months now. I'm looking to having more spare time for modelling, so should be updating this blog more frequently with what I've been up to. 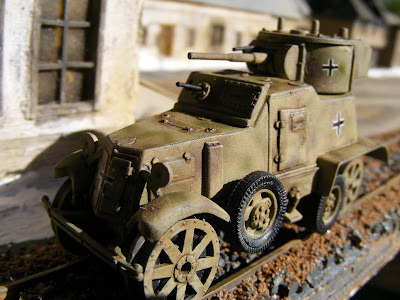 Last few models I have built have also included a construction review, but as this one was made a while ago, I wont be doing a build review on this one. Many modellers are familiar with this vehicle, its quite a popular subject among Braille modellers, examples of it have featured in recent shows. I got one modelling project near finished today. 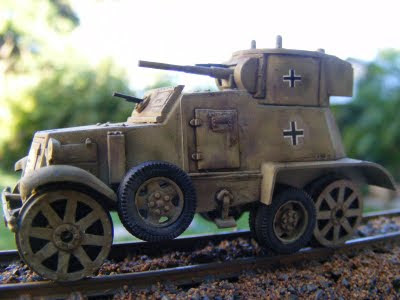 Its the UM 1/72nd BA-3ZD Armoured Car (Kit 364) with the railway wheels. Its not a newly built kit, its been sitting on a shelf, and I have never been happy with how it turned out. I made this one a couple of years ago, and sprayed it with very diluted dark yellow enamel. The intention was for the green plastic to show through in areas to simulate a worn repaint of a captured soviet vehicle, pressed into service. I tried this with some success once before on another model, but this one turned out badly, the paint was too thin, and the end colour looked more like pale brown, and totally unconvincing. Also I had placed the headlight brackets at the wrong angle and front bumper crookedly on the vehicle. 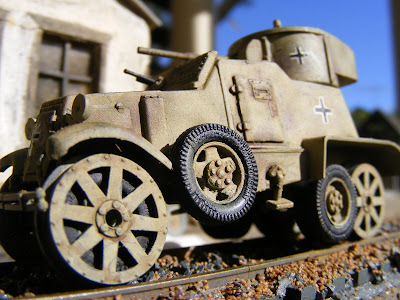 I still wanted this vehicle to be a captured one in german service. 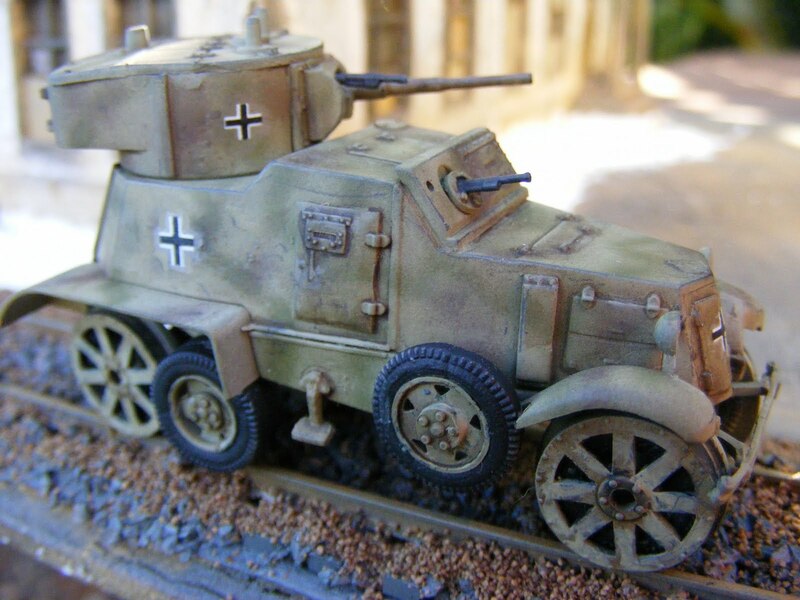 Lots of pictures exist of BA armoured cars in german use. 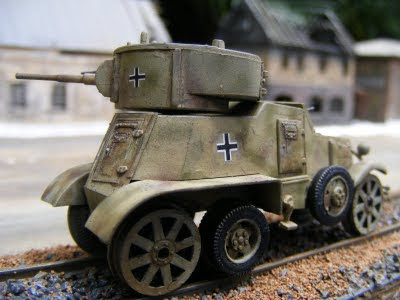 Not sure I've seen the rail version in use by the germans, but there are pictures of other soviet armoured cars converted to rail in use by the germans. The lights and bumper were a little tricky to remove, trim and refit, being very fragile, though the bumper still needs a small repair. I recently bought the "Lifecolor German WWII Tanks Set 1" which has 6 acrylic colours in it. I painted the model overall RAL 7028 Dark Yellow, with light irregular patched of RAL 6003 Olive Green and RAL 8017 Red Brown. I thinned the paint a bit with water, before spraying and was pretty happy with the end result. I wasn't trying anything intricate with the green and brown, just wanted a little irregular colour over the yellow. When throughly dry I mixed a little Burnt Umber with turpentine to highlight the recessed lines and hatches. I used a sharpened HB pencil to put a dark shine on the face of the rail wheels, and also used the pencil to put a few marks and lines to replicate slightly worn surfaces. I sprayed the whole model with thinned Aqueous Hobby Color Flat Clear to finish. The vehicle could maybe be a little dustier, and the rubber tyres are perhaps a bit too clean and black looking also. Anyway its still not perfect, but looks much better. When first built I converted this one to HO scale so that it would be easy to place on readily available track. The kit does come with a short piece of track, but I wanted to be able to place the model on a longer stretch. In retrospect I wish I had just left it as the manufacturer intended, but too much modification has been done now to change it back. The axle width now equates to very close to 'narrow gauge'. Next post will either be about the Mac Opel Blitz Holzengas, which is near complete, or perhaps an Academy Opel Blitz, which like this BA armoured car is undergoing refurbishment. I also am rebuilding the front of a Ace fz 17 Radio Car, and have an Attack Phanomen Kubel near to completion, so perhaps one of those will be the next blog update.